a simple question: I've n-by-m matrices for X and Y. When I plot them, I get m differently colored lines connecting n points. 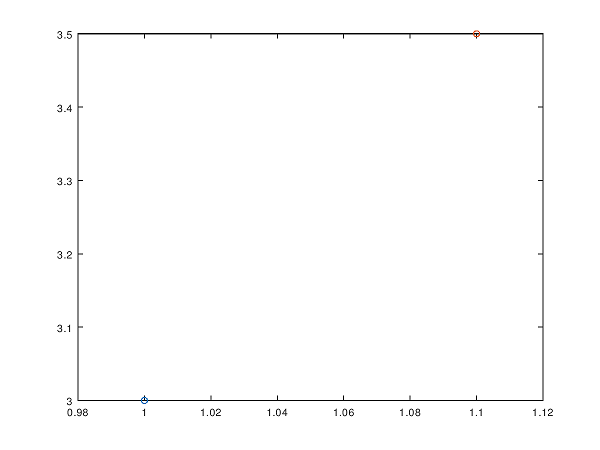 In the degenreated case with n=1, I expect and need to get m differently colored points. Instead the m points are connected to a single line. How can I prevent this in this degenerated case? @madhan ravi: why do you keep deleting your answers? @stephen I deleted in because I thought it was wrong and your advice was correct because you seemed to have overcome this issue few years ago thats why , if you could elaborate more in your answer it would be helpful for me as well. Thank you! @madhan ravi: I like your fresh ideas, and you often bring me to think about how solutions to problems are approached, which actually I find really useful to consider not just how but why some solutions work (or can be better solved in other ways). With something like MATLAB there just as many special cases as there are consistent rules, and those special cases most of the time are useful, but occasionally trip the user up because they expect something consistent with some other pattern... such as in this question. Your idea to translate the inputs was certainly intuitive, but when both inputs are vectors then they will be interpreted as one line, regardless of their orientation (see the plot help). Vectors are a special case! That is why I use NaN to force plot to interpret each column as its own "line" of one point. There certainly might be other solutions. @Stephen Cobeldick: Thank you very much :) now everything is clear as a crystal (really so happy about it), to be frank and honest in the short time I was able to improve the skills is because of you. I like the way you interpret with solutions deeply and it really tells how much of an experienced man you are , keep inspiring!